This entry was posted in Diigo, instructional design approaches, social bookmarking and tagged connotea, Delicious, delicious demise, delicious shut down, Diigo, diigo groups, diigo in education, Diigo webslides, exporting bookmarks from delicious, furl, import delicious bookmarks to Diigo, importing bookmarks, Simpy, social bookmarking, social bookmarks, tagging, tags, Yahoo. Bookmark the permalink. Thanks for the help. I have one problem. How do you get diigo to read your tags from delicious? All 500 plus of the link imported and the tags are showing, but they do not appear on the MY TAGS list. If you know how to fix this I would greatly appreciate your help. Hi Garth, I’m not sure. I noticed that while all my delicious bookmarks have imported only some of my tags are showing up in the “my tags” list (I added an additional “delicious” tag so I could keep track of them). 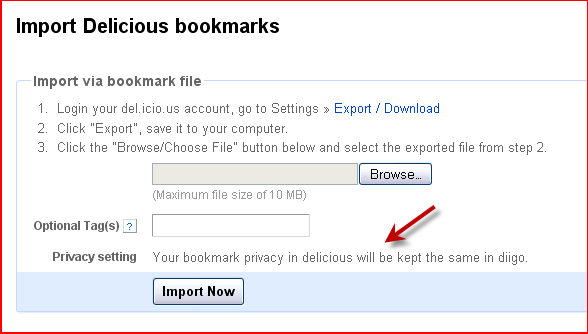 In other words,398 of my delicious bookmarks are visible in my library with their tags but only 98 delicious tags are showing up in the “my tags” list. I wonder if there’s a delay (though not sure why there would be). I haven’t received an official email telling me the process is complete. Hunting for more information on Diigo and will post if I can find more answers. I updated the blog to add a bit more information, I wonder if the “my tags” issue is because of some of the code changes Diigo’s trying to speed up the import process. You might try contacting Diigo on Twitter (@Diigo) to see if they know about this issue. With over 6000 bookmarks over 4 years, I suspect my transfer may take until sometime next summer if comments I’m seeing around the web are anything to go by. I just hope they all go through without any hiccups before Delicious is finally … sold/shutdown/whatever. Very helpful post, well done. I found the list of Diigo groups helpful – saved me time so I can back to nail biting as I wait for my Diigo acct to load up 🙂 Happy holidays! I’m glad the group list is useful. I actually added four more to the list that I’d forgotten about. It’s also really easy to create groups, which is one of the other reasons I like Diigo. You can create groups for class projects and make them open or private.